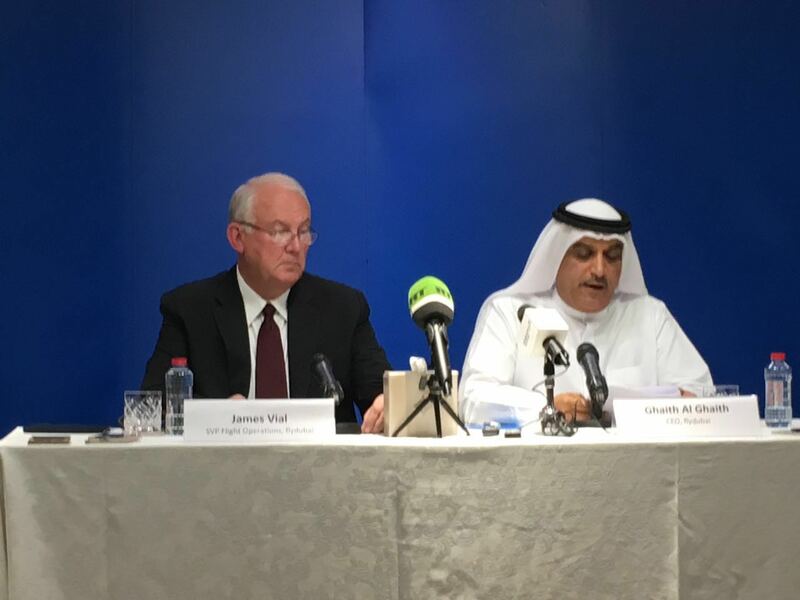 1.43pm: "The pilots make the decision to operate and land in the flight on the best information we have and it is their call in coordination with the authorities," said Flydubai chief executive Ghaith Al Ghaith. "Both pilots had landed at the airport before." "No other airline involved in the investigation. "Flydubai pilots and and cabin crew have not been banned from speaking to the media. 1.36pm: The crash report 'may take months to be published', said Ghaith. 1.34pm: "It's not our call whether the airport should have been closed, said the Flydubai chief executive. 1.32pm: "The airport had ILS facilities," said Vial. "We take the highest standard in safety and security in our airline," added Ghaith. 1.31pm: "We are not commenting on anything involving the operations," said Ghaith. 1.30pm: On reports that the families of the victims will be paid one million roubles by the Russian government, Ghaith said: "This is part of the procedures that we take through the insurance company. This was payment that we will make to the families and at the end of the investigation we will be specifying the final full about but this is just the first payment." Ghaith added: "We have a very higher praise for the Russians since we have started operations to Russia. "We are not commenting on anything involving the operations." 1.29pm: "We have high confidence in the Russian authorities in managing local flights and we fully trust the Russian authorities in managing this," said Ghaith. 1.26pm: "Our aircraft are fully insured," said Ghaith. "Concerning the airport and weather conditions, the airport was open and the conditions were normal and allowed the operations of this airport. This was the decision of local authorities in Russia." 1.25pm: "We expect quite a bit of information to be recovered from the black boxes," said Vial. 1.21pm: "We share the desire to get the answer as quickly as possible but we should not be drawn into speculation. "We have specialists from our safety, security and engineering departments on the ground at the site, providing assistance to the local investigation." 1.19pm: "We now have our own specialists on the ground in Rostov and in Dubai for families of the victims," said Ghaith. "We should give families of the victims time and space to grieve. 1.15pm: Flydubai is working hard to find the best ways possible to support and care for the families and crew members who were lost as a result of this accident, the airline's chief executive said at a press conference on Sunday. "We are working hard to find the best ways possible to support and care for the families and crew members who were lost as a result of this accident. We are also preparing to help the families who would like to visit the crash site and we hope to give the necessary privacy for these families so they can express their sadness," Gaith Al Gaith said. "Yesterday we exerted all efforts to contact all family members. As we said yesterday we will not be releasing the names of the passengers and crew until we are sure the families have been notified. "We know that during the last 24 hours we heard a lot of speculation about the reasons behind the accident however and although we would really like to answer all the questions possible we would like to invite everyone to avoid speculation and wait for the results of the speculation."